HERE ENDS THE THIRD BOOK OF THE INHERITANCE CYCLE. THE STORY WILL CONTINUE AND CONCLUDE IN BOOK FOUR. Not cool. So very, very not cool. But I’m finished with Eldest and can’t stop now — it was such a good read, and not one that I can set aside now even though I know the fourth and final book is still forthcoming with no set release date and nothing more than the intended cover art (an emerald green dragon) indicated. 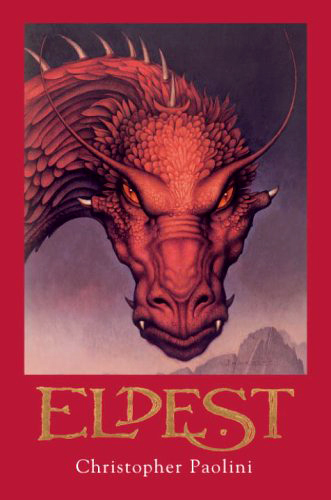 So about Eldest…it was just as good as Eragon, perhaps even better. Initially I was mildly irritated with the shifting focalization — most chapters are still focalized through Eragon and Saphira, but in this novel significant chunks are given to Roran and Nasuada as well. Since I don’t handle suspense well, this technique frustrated me at times, but by the end of the novel as the characters’ storylines converged, I found myself enjoying it more and more. It’s always interesting to see how an author experiments with form even within a series — and Paolini didn’t disappoint.I do find that Paolini tends to satisfy my desire for happy endings and easy solutions (such as the changes that are worked on Eragon during the Agaetí Blödhren, or Blood-Oath Celebration, where his disheartening injuries are miraculously healed and his powers generously increased), a tendency that is neither good nor bad — simply satisfying. And on that note, I am off to begin the third (but not final) book in what was once referred to as the Inheritance Trilogy, but has now become the Inheritance Cycle.